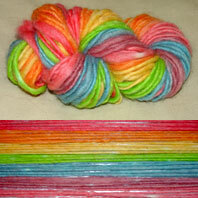 First yarn: 35 yds, self-striping rainbow. 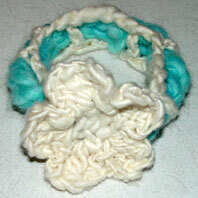 I made this one before I knew about the magic of microwaving the dye, so the colors are a little washed out. 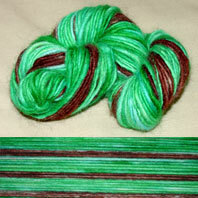 Second yarn: 67 yds, also striped. I meant for the green to be much more blue. I'm still learning how each dye color behaves. 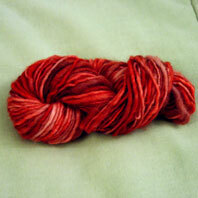 Third yarn: 45 yds, random red tones. This one is my favorite so far. I've been wanting to invent a pattern for a ruffly scarf for a while. The basic gist of this type of pattern is that you cast on some stitches (I did 100) then you alternate knitting 1 row, then increasing every stitch for 1 row. This gives you a cool ruffle effect, but it also gives you 800 (or, god forbid, 1600) stitches on your needle when you're done. Since I didn't plan very far into the future when starting, I used my 24" US 10.5 needle. I figured I'd just use my double pointed needles on the end to give myself some extra room. 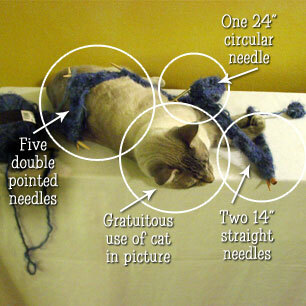 Except those filled up too, and I had to add my straight needles to the mix as well. Long story short, I ended up with a hilarious zigzagging frankenstein contraption that spanned across 90" and 8 separate needles. I'm still only halfway done binding off because the UberTight fabric makes my fingers hurt after about 50 stitches. At that rate, it should only take me about 7 more tries to finish it. I ordered and received my spinning supplies this past week. I got a cheapie spindle and 8 oz. each of cotton and wool, along with a book called Spin It from Amazon. 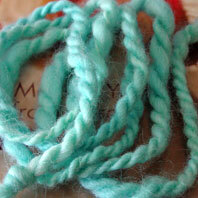 I immediately went to work spinning my first yarn (wool, dyed blue with Kool-Aid) and my second yarn (un-dyed cotton). 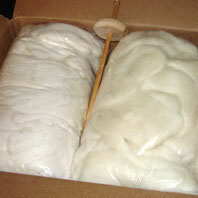 I found the cotton infinitely easier to spin, but I was much happier with the wool's finished product. The cotton yarn fell apart easily, although I was eventually able to crochet it into a bracelet (The only unexpected breaks happened while weaving in the ends.) The finished bracelet really is a face only a mother could love, but I think beginners are allowed to be naively proud of their first projects.